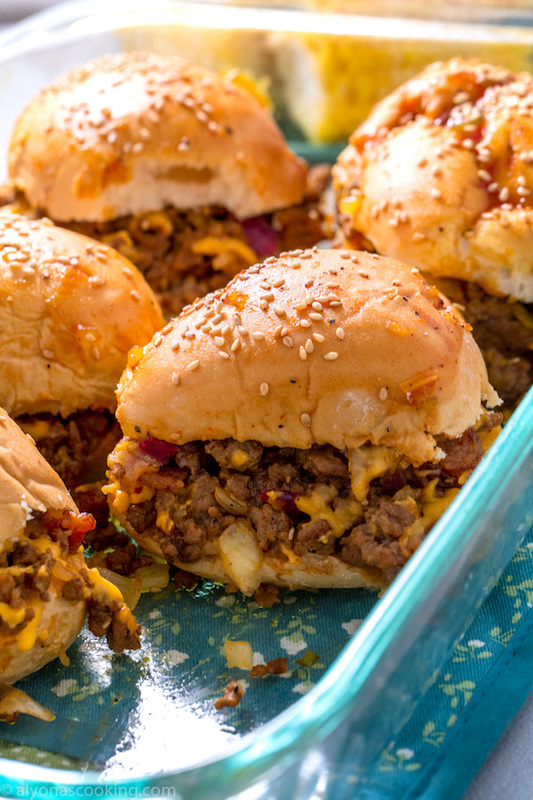 These are the perfect sized cheeseburger sliders and so EASY to make! 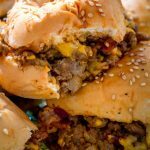 Find out which rolls make these perfectly sized baked burgers and how easy these cheeseburger sliders are to make! 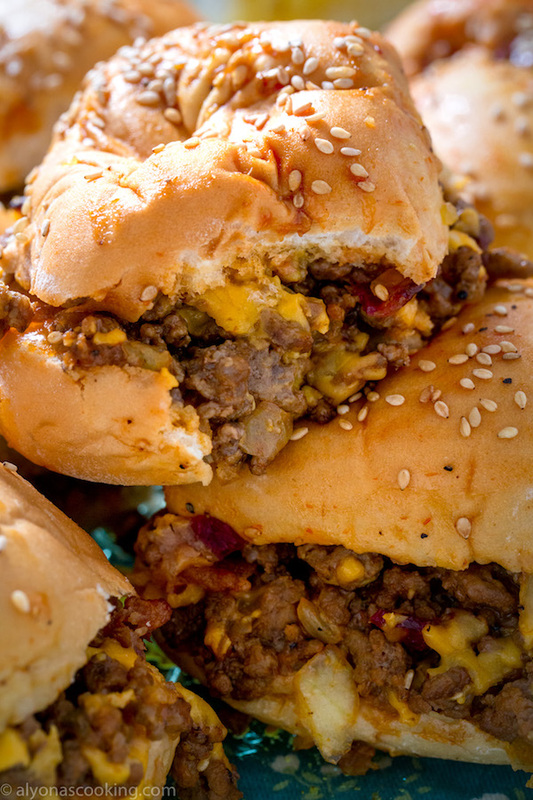 Call it lazy cheeseburgers if you want because these involves very little effort to assemble. Kinda like sloppy Joes but cheeseburger tasting! These have bits of bacon in it but that can totally be omitted. And if you havn’t discovered my freezer bacon recipe, then are you missing out on a super easy way to have ready bacon! They can be popped into the oven during the time you put your groceries away and you’ll have ready to freeze bacon that can be used ANY time you’ll need it! It reheats FAST and can be such a time saver! Make these EASY cheeseburger sliders with or without bacon and get prepared…It may be hard to stop at just one! 1. Brown beef: drain fat and add onion. Saute for about 3 more minutes. 2. Whisk together the sauce ingredients, reserving 2 TBSP of the sauce for the tops. Pour sauce into the beef mixture and saute for an additional 2 minutes. 3. Preheat oven to 350° F and grease a glass pyrex dish with cooking spray. Cut rolls in half and assemble them into the dish. Sprinkle half of the cheese onto the bottom. Top with the meat mixture. Sprinkle with bits of bacon and top with the remaining cheese. Place tops of buns over the filling. 4. Dissolve 2 TBSP of the reserved sauce and 2 TBSP of water together. Brush tops with mixture and sprinkle sesame seeds over the buns. Cover sliders with aluminum foil (trying not to touch the tops too much) and bake for 20 minutes. Brown beef: drain fat and add onion. Saute for about 3 more minutes. Whisk together the sauce ingredients, reserving 2 TBSP of the sauce for the tops. Pour sauce into the beef mixture and saute for an additional 2 minutes. Preheat oven to 350° F and grease a glass pyrex dish with cooking spray. Cut rolls in half and assemble them into the dish. Sprinkle half of the cheese onto the bottom. Top with the meat mixture. Sprinkle with bits of bacon and top with the remaining cheese. Place tops of buns over the filling. Dissolve 2 TBSP of the reserved sauce and 2 TBSP of water together. Brush tops with mixture and sprinkle sesame seeds over the buns. Cover sliders with aluminum foil (trying not to touch the tops too much) and bake for 20 minutes.